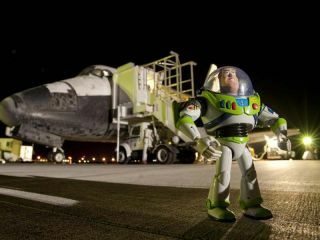 Buzz Lightyear in front of the Space Shuttle Discovery after his record 468 days in space. Astronaut Anthony W. England, mission specialist, drinks from a special carbonated beverage dispenser labeled Coke while floating in the middeck area of the shuttle Challenger during the STS-51F mission in 1985. Note the can appears to have its own built in straw. Buzz Lightyear floats aboard the International Space Station during his 468 day mission. The original lightsaber used by Luke Skywalker in the film 'Star Wars' will fly to the real space station on shuttle Discovery's STS-120 mission in October. This lead cargo tag -- which reads "Yames Towne" -- is believed to have been discarded from a shipping crate or trunk arriving at Jamestown, the site of the first permanent English settlement in the Americas, from England in about 1611. NASA will fly this artifact and two sets of Jamestown commemorative coins aboard Space Shuttle Atlantis in March 2007. NASA is taking three green starter's flags from the Daytona 500 into space to mark the 50th anniversary of NASA and NASCAR's premiere race. Astronaut Garrett Reisman , a fervent Yankee fan, brought the small container of dirt with him, along with other mementos of his favorite team, including a banner and hat autographed by George Steinbrenner, who was the principal owner of the team for 37 years, from 1973 to his death in July 2010. You can follow SPACE.com Staff Writer Denise Chow on Twitter @denisechow. Visit SPACE.com for complete coverage of Atlantis's final mission STS-135 or follow us @Spacedotcom and on Facebook.